HOWEY-IN-THE-HILLS, Fla. – University of Mary Hardin-Baylor women’s golfer McKenzie Ralston won the 2015 NCAA Division III Women’s Golf Individual Title with a final round score of 77 Friday afternoon for a four-stroke win at Mission Inn Resort in Howey-in-the-Hills, Florida. Ralston’s individual title is the first NCAA individual national championship in school history and second NCAA national championship for the women’s golf program who took the team title in 2013. Ralston came into the final day of competition with a three-stroke lead for the individual title. She started her final round of competition on the back-nine, opening the day with a par then carding a bogey on hole 11. She hit par her next two holes before taking a double-bogey on hole 14. From there, Ralston was able to fight off strong winds and make clutch shots from difficult spots to save par, allowing her to pull away from the field. She finished her collegiate career shooting seven pars on the front nine, carding a 74-71-79-77=301 for the national title. Ralston’s 72-hole score tied Taylor O’Rear‘s 301 scorecard at the 2013 national championship for the lowest 72-hole score in program history. Macy Hubbard from Wittenberg University took second, carding a 78-80-72-75=305 while Sophie Kitchen of Williams College took third with a 75-79-77-77=308. Williams College also took the team title, shooting a 319-322-309-313=1263 with Wittenberg University claiming the national runners-up title with a 323-327-308-323=1281. American Southwest Conference foe U.T.-Tyler finished fourth with a 334-320-320-315=1289. Ralston was named All-West Region and First Team All-American after a stellar senior campaign. She finished in the top-ten in all eleven tournaments for UMHB this season and set a new program record for individual wins with six. She also shot par-or-better seven times this season, breaking the previous record she set in the 2013-14 season (two). Ralston won her second consecutive ASC Individual Title and was UMHB’s first individual qualifier to the NCAA DIII Women’s Golf National Championship. She finished second at the national tournament a year ago and is the first athlete to win an NCAA Division III individual national championship in school history. Denise Thiele won the NAIA Individual National Championship in 2000 for UMHB while also leading the Cru to the NAIA Team National Championship that year. Ralston’s national title is also the first under head coach Jackie Ralston who took over the program in the 2013-14 school year. 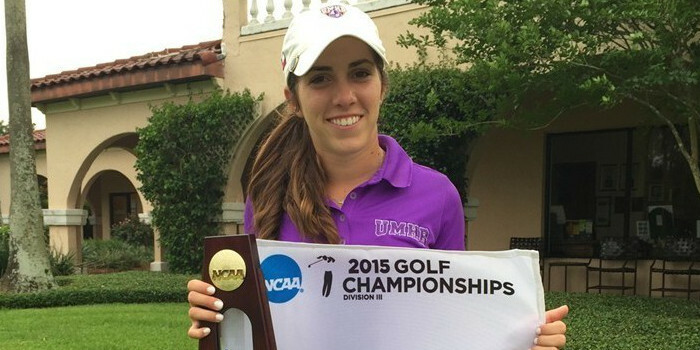 UMHB’s McKenzie Ralston talks winning Individual Title at 2015 NCAA Division III Women’s Golf National Championship.